It’s the sketch challenge over at Splitcoast today. I’ve used the colors from one the LOVEFEST challenges also going on at Splitcoast. This card starts with a standard 4.25″ x 5.5″ card base. I’ve stamped the fun border print from Avery Elle along the right hand side of the card in three different colors. 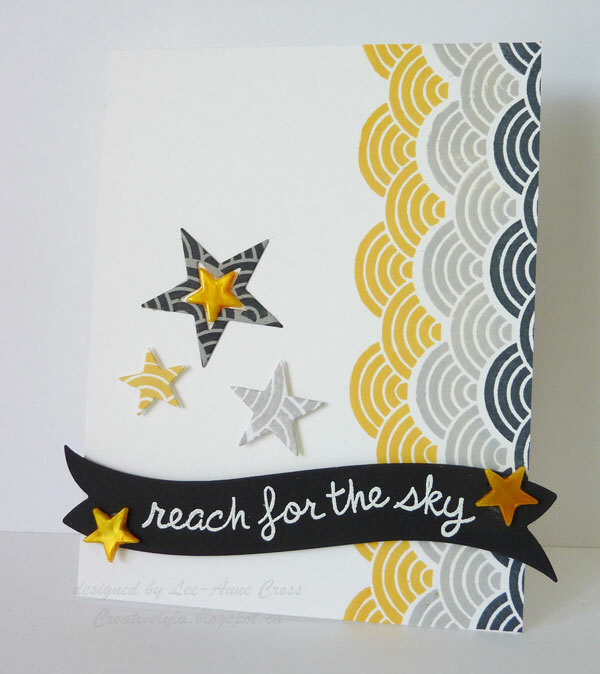 Then I stamped the same border print on different sheets of card stock and die cut the stars. The two smaller stars are popped up with dimensionals. The sentiment has been stamped on a die cut from Lifestyle Crafts, embossed in white and popped up with dimensionals. The stars were snapped off some pins that I have and adhered them to the card with Ranger Glossy Accents. Hope you’re all enjoying a great week! Absolutely LOVE this card, Lee-Anne!! Fabulous colour combo and design!